English archeologist; born at Shirehampton Sept. 25, 1846; educated at Grosvenor College, Bath, and Queen's College, Oxford, becoming fellow in the latter in 1869 and tutor in 1870. He was deputy professor of comparative philology at Oxford from 1876 to 1890, and a member of the Old Testament Revision Company from 1874 to 1884. He is the author of many works on Assyriology, and has attempted the deciphering of the Hittite inscriptions as well as those of Lake Van. He assisted Professor Cheyne in compiling the notes for the "Queen's Printers' Bible" (1881), and wrote an introduction to the books of Ezra, Nehemiah, and Esther (1885). Sayce has devoted considerable attention to Biblical anthropology, on which subject he has written "The Races of the Old Testament" (1891). While accepting some of the results of recent criticism (as to the date of the Book of Daniel, for example), he has written a series of books adducing the evidence of the El-Amarna tablets and other inscriptions in support of the authenticity of the early Old Testament narratives. His works on this subject include: "Fresh Light from the Ancient Monuments" (2d ed., London, 1884); "The Higher Criticism and the Verdict of the Monuments" (ib. 1894); "Patriarchal Palestine" (ib. 1895); "The Egypt of the Hebrews and Herodotus" (ib. 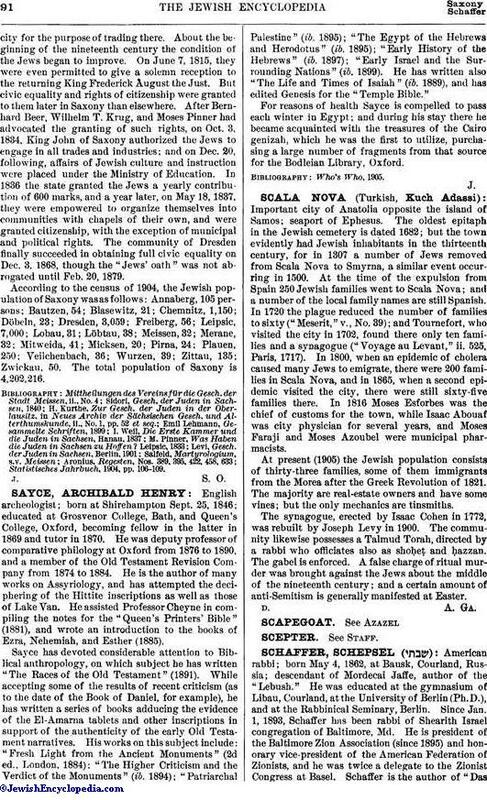 1895); "Early History of the Hebrews" (ib. 1897); "Early Israel and the Surrounding Nations" (ib. 1899). He has written also "The Life and Times of Isaiah" (ib. 1889), and has edited Genesis for the "Temple Bible." For reasons of health Sayce is compelled to pass each winter in Egypt; and during his stay there he became acquainted with the treasures of the Cairo genizah, which he was the first to utilize, purchasing a large number of fragments from that source for the Bodleian Library, Oxford.